Udesignit is a Sydney based online printing company. 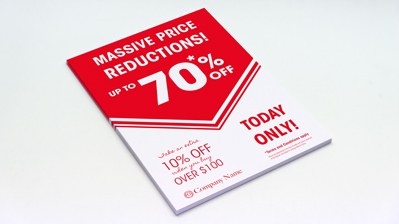 We provide a wide variety of in house manufactured printing to support small to medium sized business Australia wide. Our one colour flyer printing is now available as an online product. 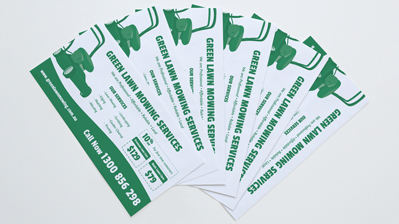 You can select from a range of ink colours and have your one colour flyers printed one or both sides. It would a good change to mix up your communications, try an order today, be a bit different, go back to the old classics and try a one colour flyer for your promotion or event. Keep your budget down with our single colour flyers. 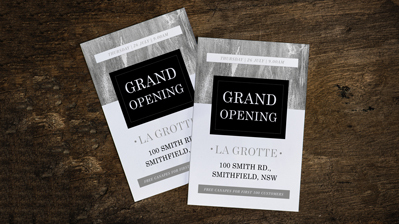 Our single colour flyers come quality offset printed on 80gsm white bond ready to help get your message out with less bells and whistles making them a budget friendly option. Wether you need to prepare your flyers for a letterbox drop, a newsletter handout, or a neat Gospel Tract. We can print and fold your order in a well presented way, giving you the confidence to focus on the people your providing the message to. Did you know we mix PANTONE colours. We even provide a selection of 19 colours to choose from with no additional charge for mixing. You may have a particular colour requirment to meet your branding specifications, in which case you may provide the PMS ink number and we can have your colour created. This product is based on a 7 Working day ETA. Let us know if you have an event to attend and require a faster turn-around time. We can discuss these options further at your request. You can use our online design studio to create an impacting flyer design. We include graphics, elements, images and a number of other neat tools to enable you. Same day brochures - When you need brochures within hours or before the days ending, select same day printing within the price calculator. Same day printing is available Monday to Friday 9:00am to 5:00pm. Confirm your request, before ordering, we ask you provide the order before midday, this gives us time for processing your order, again please confirm your urgency via a phone call. Uploaded artwork needs to be print ready, if you don't have print ready artwork, try using our pre-designed templates which are editable for future re-ordering. You Design It, flyer design for free. We also have pre-designed brochure templates, flyer templates, to help get started. Or click the upload button to send existing print ready artwork. Don't forget we are only a phone call away if you need any guidance in navigating our online design and print shop. Start now and see how easy it is. One Colour Flyers are batched in 500 quantities with board seperators, carton packed, ready to pickup or dispatch. Print the second side for additional. Folding is available for A3, A4, A5 sizes.